Geoff Griffin—a regular City Weekly freelance contributor—has just published his first work of fiction, Brooklyn Bat Boy. It's the story of Jackie Robinson's 1947 rookie season with the Brooklyn Dodgers, through the eyes of Bobby Kelly, a 12-year-old fan observing the struggles of Major League Baseball's first African-American player from up close. Griffin will read from and sign the book April 15 at The King's English Bookshop (1511 S. 1500 East, Salt Lake City, 801-484-9100, KingsEnglish.com) at 7 p.m.
What was the inspiration for telling the Jackie Robinson story in a fictionalized form aimed at kids? I have a background as a sportswriter, and I also teach elementary school. I thought it would be fun to write a sports book for kids, and ... the most important figure in American sports history is Jackie Robinson. I felt there were so many great lessons kids could learn from Robinson's story. It's got good triumphing over evil, a hero and, best of all, baseball. How is it to tell a period-piece story while still hoping to engage young readers? I tried to make it fun by throwing in scenes where Bobby is playing stickball with his friends, sneaking into Ebbets Field in Brooklyn, N.Y., and getting into other mischief. I also used a lot of slang from 1940s New York. ... We even put a glossary in the back. Hopefully, when kids are done with the book, they know the difference between a "knucklehead" and a "knuckle sandwich." Are incidents involving Robinson's interactions with teammates and opposing players more historical than fictional? A lot of that is very history-based. There were a couple of times where I did need to alter things a bit. There's a famous [incident] where Robinson is getting heckled on the road, and Pee Wee Reese comes and puts his arm around him and everything goes quiet. I switched that to having it happen at Ebbets Field, so Bobby can see it. What's the most interesting thing you learned while researching that you hadn't known before? When we look back on the 1947 season, it seems obvious that things would work out the way they did: Baseball would become integrated, Robinson would become a Hall-of-Famer, etc. In researching how things actually unfolded that season, it's amazing that it all worked out. There were so many times that things could have gone horribly off the rails. 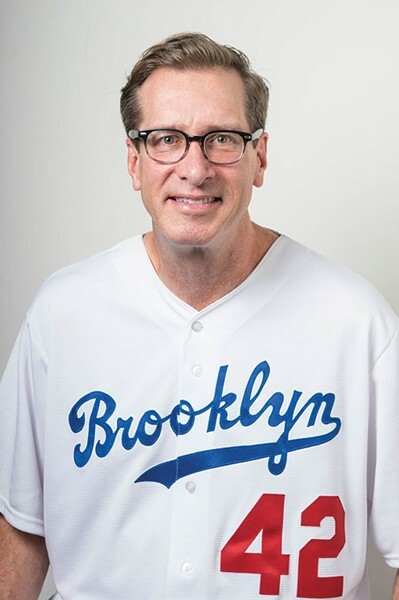 [Dodgers owner] Branch Rickey was a visionary, and Jackie Robinson was a genuine American hero for doing what he did.